Lyrics of the song the children sang during the visit. 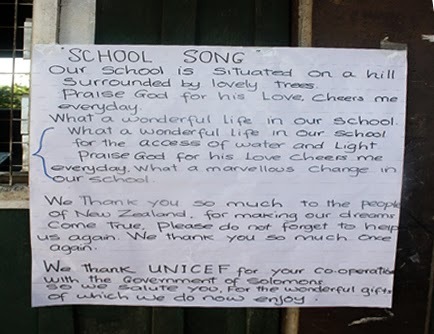 The lyrics of the song speaks volumes of the gratitude that Titinge Primary School students have towards the Government and people of New Zealand as well as UNICEF. Their appreciation is for enhancing their learning environment through the solar power for schools pilot project and the upgrade of water and sanitation facilities. Early this week the students got the chance to present the song to the Ms. Yoka Brandt, UNICEF Deputy Executive Director (DED), Daniel Toole, UNICEF Regional Director (RD) for East Asia and Pacific and a representatives from the New Zealand High Commission Office, during a special visit to the school. Upon arrival the students garlanded the visiting delegation with a colorful necklace made of orchids and just before they began their tour of the school, the children, dressed in bright, clean purple and white uniforms, serenaded the visitors with their song. The delegation then toured the classrooms and were impressed with the management and sustainability of the solar power system and the cooperation among the school staff in ensuring that they take full responsibility and ownership of the solar system. The children also presented poems on how to conserve water as well as demonstrations on hand washing. Ms. Brandt and Mr. Toole also sang along and washed their hands with soap with the newly installed water tap. The School Principal is proud that since the solar power was installed, more children are attending regularly, study sessions can be held even after dark, and a higher proportion of children recently passed their exams. Even some secondary students come to the school in the evening to study. There is enough solar power to do even more at the school, and ideas such as women’s income earning projects and a digital library are under discussion. The lack of light, clean water and sanitation is still a challenge for the many schools throughout the country often hindering the children and teachers in reaching their full potential to learn and teach. The upgrade and installation of water and sanitation facilities is funded by the UN Trust Fund for Human Security (UNTFHS), with work on another nine primary schools throughout the country in progress. The solar power for schools pilot project funded by the New Zealand Government and UNICEF New Zealand commenced last year with installation of solar panels in five schools in Guadalcanal province. Work on another nine primary schools in Choiseul province have already commenced and is expected to be completed by the end of this year.